In recent years, centuries of discrimination and a lack of understanding of indigenous land tenure have given way to new constitutions and laws recognizing the pluricultural nature of Latin American states. Large tracts of land have begun to be recognized as inalienable territories under collective ownership of indigenous peoples. Despite these gains, in many Latin American countries indigenous peoples still face major obstacles to effective recognition of their land rights, while their territorial security is threatened and undermined by political and economic interests that promote destructive land uses on indigenous lands. International aid agencies have begun to support land titling projects, but the results have been mixed. It is concluded that such agencies should build on best practice in participatory land demarcation and titling, learn from past mistakes and support the promotion of indigenous land tenure issues in national plans and policies. Indigenous peoples in Central and South America total an estimated 40 million people, of which nearly 90 percent depend on land and natural resources to sustain their rural livelihoods (ECLAC, 1995: p. 99). In Bolivia, Ecuador, Guatemala, Mexico and Peru indigenous peoples make up a substantial proportion of the national population. Elsewhere in the region, aggressive colonial expansion has caused the demographic collapse of indigenous peoples, who today constitute minority populations. Indigenous peoples throughout the continent suffer high levels of poverty and are more likely to be poor than nonindigenous people (Psacharopoulos and Patrinos, 1994). Pervasive indigenous poverty is often exacerbated by insecure and inadequate land tenure arrangements for indigenous families and communities (Plant, 1998). This article gives a brief overview of the key issues surrounding land tenure, land administration and indigenous peoples in Latin America. The aim is to document general patterns and trends. The article does not examine in depth the historical and legal evolution of land policy in any particular country. The current land tenure situation of indigenous peoples in Latin America is closely related to the history of colonial and nation-state policies towards indigenous peoples and their lands. 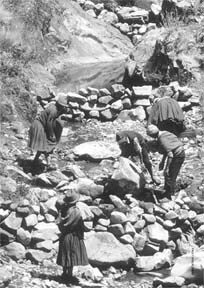 In upland areas of the Andes and Central American highlands, early Spanish colonization and agricultural expansion largely (but not entirely) replaced indigenous subsistence and ritualoriented agrarian structures with Iberian land tenure systems based on plough agriculture geared towards the production of surpluses to supply religious missions, colonial settlements and mines (Wolf, 1959; Goodman and Redclift, 1981; Redclift, 1987: pp. 107 - 113). Indigenous lands on fertile coastal plains were also expropriated to establish plantations used to supply raw materials to growing economies in Europe (Monbiot, 1995; Iturralde, 2001: p. 9). Spanish settlers viewed Indian tenure and land use as an obstacle to agricultural development. These deep-seated prejudices have informed land policy throughout Latin America until recent times (Brockett, 1990: p. 14; Benton, 1999: pp. 22 - 33). The colonial powers made only faltering attempts to settle densely forested tropical lowlands. Nevertheless, lowland indigenous populations were seriously reduced by a predatory slave trade supplying colonial plantations throughout the seventeenth and eighteenth centuries (Llanos and Pineda, 1982; Roosevelt, 1994; Baleé, 1995; Whitehead, 1988). Following independence, new nation states undertook reforms in the nineteenth century to abolish the remaining communal land titles. These reforms, which aimed to modernize the agricultural sector, resulted in the expansion of large hacienda estates that appropriated more indigenous land. Liberal policies therefore consolidated the bimodal structure of land holdings in the highlands of Latin America. This dualistic tenure system is characterized by relatively few large commercial estates known as latifundios (>500 ha) and numerous small properties known as minifundios (<5 ha). These mainly subsistence-oriented smallholdings are farmed by indigenous and peasant households. The integrationist policies of liberal governments were partially reversed by subsequent administrations, which introduced protectionist legislation to reinstate the indigenous communal rights to land - often in response to popular resistance by the indigenous peoples themselves and to the international antislavery movement (Gros, 1991: p. 179; Howe, 1998: p. 292). Despite the repeal of laws breaking up communal lands, the concentration of landholdings continued throughout the agricultural regions of Latin America. Serious land pressures resulted in popular revolution in Mexico in the early part of the twentieth century, and inequitable ownership and control of land stimulated social unrest and mass land invasions of upland haciendas by indigenous communities and peasants in Bolivia, Ecuador and Peru (Barraclough and Eguren, 2001: p. 223). Agrarian conflicts prompted many Latin American governments to institute land reform programmes from the 1950s until the 1970s. These reforms had land redistribution goals, but they were mainly modernist programmes that aimed to break up idle hacienda lands and boost national agricultural production (Johnston and Kilby, 1975; Shaw, 1977). Lip service was paid to poverty reduction and support for peasant farming in government agricultural modernization programmes but, in reality, agricultural policies targeted commercial farms (Bebbington and Thiele, 1993: pp. 32 - 36). The programmes were top-down (many imposed under authoritarian regimes) and did not engage indigenous peoples and the rural poor in their design. Most were implemented without consideration for indigenous tenure regimes. In Peru, legally recognized indigenous communities were redefined as peasant communities in which landholdings were allocated through cooperatives. The imposition of non-indigenous landholding bodies based on peasant social models also occurred in Bolivia (Carter, 1964) and Ecuador. Most land reforms in Latin America had a patchy redistributive impact as commercial landowners managed to retain more fertile land, whereas indigenous households received small plots on marginal lands (e.g. Grindle, 1990; Iturralde, 2001: pp. 11 - 12). Although land reforms did liberate millions of indigenous people from obligations to provide unpaid labour to the owners of haciendas, they still left most families with relatively small land parcels that would be subdivided as a result of population growth and division among descendant generations (Preston and Redclift, 1980; Hess, 1997: p. 21). Moreover, decades after the reforms, many indigenous households in Latin America remained without legal title to their landholdings (Barraclough and Eguren, 2001: p. 226). During the 1960s, 1970s and 1980s, governments in Brazil, Colombia, Ecuador and Peru and several national administrations in Central American countries sponsored the agricultural colonization of tropical lowlands to relieve continuing land pressures in more populated regions. These colonization programmes were founded upon a legal fiction that lowland forest regions constituted an empty and unoccupied reserve of abundant underutilized land. Plots were allocated to colonists without consideration for prior indigenous land ownership, creating severe land conflicts between colonists and indigenous communities. In most Latin American countries, national civil codes relating to property rights confined the social function of rural property to agricultural use (Grasmick, 1979: pp. 765 - 766; Roldán, 1992: p. 47). Land laws underpinning colonization schemes consequently encouraged colonists to deforest land to claim property rights for improvements (mejoras) involving the conversion of land to pasture and crops (Hecht and Cockburn, 1990; Rudel and Horowitz, 1993; Mahar and Schneider, 1994: pp. 162 - 163). Colonization programmes also involved road-building projects, which opened up indigenous lands to both state-sponsored and illegal colonization (Barbira-Scazzochio, 1980; Dorner and Thiesenhusen, 1992; Moran, 1996; Bedoya and Klein, 1996: p. 169). During the 1960s and 1970s, many of these large-scale road, dam, mining and agricultural schemes were supported by transnational agencies such as the World Bank whose mega-projects caused resettlement, land loss, impoverishment and increased vulnerability of indigenous peoples (Davis, 1973; López, 1992; Gray, 1998a). Where governments established Indian agencies, these applied paternalistic and integrationist policies. Indian agencies such as the Fundação Nacional do Índio (FUNAI) in Brazil were directly involved in suppressing indigenous political organization. In the worst cases, corrupt officials were involved in the exploitation and appropriation of indigenous lands and resources (Maybury-Lewis, 1991: pp. 223 - 224). In other countries, for example Mexico, indigenist policies sought to impose education, agriculture and social programmes devised by central government, with little recognition of local cultural knowledge and indigenous governance. Variable assimilationist and protectionist policies together with land reform and colonization programmes have produced a complex pattern of indigenous land tenure in Latin America (Swepston, 1978; Grasmick, 1980). Given the contrasting history of upland and lowland regions, indigenous land tenure in the Andean valleys and Central American highlands shows marked differences from that of the tropical lowlands. In highland areas, where indigenous peoples are typically more integrated into the market economy, land ownership and use regimes have developed a hybrid quality with elements of both Iberian and Amerindian tenure. For example, it is common for private land to be fenced, whereas common land remains unenclosed. Indigenous households may simultaneously hold private land individually and also possess access rights to communal lands, which may include cultivable plots, grassland and moorland. Households strive to work multiple land parcels that are spread vertically across different agroecological zones (Lehmann, 1982; Hess, 1997: p. 23). In a few cases, indigenous tenure regimes in the Andean highlands cover a more or less contiguous territory associated with one ethnic group (Harris, 1999). In most of Latin America, however, indigenous lands in the uplands are made up of fragmented holdings. These lands are interspersed with or adjacent to large- and medium-sized commercial farms that usually cover the more fertile land. As noted above, indigenous holdings form part of the minifundio sector within the highly inequitable latifundio - minifundio agrarian structure, which still dominates in upland South and Central America despite past land reforms (Barraclough and Eguren, 2001: p. 247; Mozder and Ghimire, 2001: p. 196). The indigenous people cannot accept a law that promotes the renewed concentration of land in the same hands as always and prohibits indigenous access. Without space to spread out, we will have to leave and die of hunger and misery in the cities. In lowland areas of Latin America less affected by fragmentation under liberal and land reform policies, customary indigenous tenure regimes cover extensive contiguous territories that encompass a range of habitats including forests, savannahs, rivers, lakes and rock formations. Most lowland groups have subsistence livelihoods based on shifting cultivation, hunting, gathering and fishing. Traditional tenure exhibits a nested structure with larger collective territorial units enclosing smaller units, which correspond to specific access, use and proprietary rights (García, 2002). The largest spatial area or maximal territorial unit relates to the land and resources traditionally used and occupied by an ethnic group that may be composed of a number of different clans and settlement groups (Grasmick, 1979: p. 770). The limits of this maximum territory are defined by regular and intermittent resource-use patterns of the residence groups that may extend a long way from settlements: hunting trails and hunting grounds, fishing camps, rubber camps, clay pits, distant swidden fields, clearings for boat-building, etc. Territorial boundaries are also defined by spiritual and sacred landmarks (see, for example, Rodríguez and Van der Hammen, 1990: pp. 196 - 199). Rather than western notions of rigidly bounded properties, the collective holding of the maximum territory is often expressed in the idiom of belonging to an ancestral homeland, birthplace or cradle (Oliveira, 1989; Arruda, 2001: p. 49). Indigenous food security in the tropical lowlands is based on access to different and dispersed resources across the landscape. The precise mix of different subsistence activities in indigenous livelihoods varies according to cultural preferences and local ecological conditions. Some are especially dependent on shifting cultivation, whereas others have livelihoods more centred on fishing or hunting (Werner et al., 1979; Baksh and Johnson, 1990: pp. 214 - 216). However, in all these horizontal economies livelihood security is dependent upon access to extensive land areas (Plant and Hvalkof, 2001: p. 26). In most lowland areas of South America indigenous economies are undergoing varying degrees of monetization. Indigenous households are therefore today engaged in mixed livelihoods that involve both subsistence activities as described above and some commercial activities to generate cash income. Access to cultivable land through social ties and co-residence forms an integral part of this mixed livelihood strategy. Secure rights to subsistence resources are essential for self-provisioning and food security of households when commercial work is limited or during periods of unemployment. Access to communal lands therefore forms a vital safety net during hard times (Salick, 1992; Hammond, Dolman and Watkinson, 1995). The defence of our territory has deep meaning for the Yaqui, it is the defence of much more than a piece of land. For the Yaqui, the territory is ... like a nest or receptacle, a great space that contains. The sense of property and identity around our territories has mystical value ... We feel that a Yaqui outside his territory is less of a person because being Yaqui includes an identity which is the sum of many things: land, water, culture, language, sea, mountains, forests and much more. The territory is considered to be a communal possession of a distinct people or ethno-linguistic group. Customary norms stipulate that the territory is to be shared for the benefit of the collective and prohibit alienation of the whole or any portion of it (no matter how small) by any individual, family, community or other association (García, 2002). Unlike the civil codes of many Latin American countries, which dictate that land ownership rights derive exclusively from the social function of rural property when put to agricultural use, indigenous customary laws see exclusive rights of possession flowing from use, occupancy, practical and spiritual knowledge, and religious and spiritual ties to the land. In many indigenous societies, traditional territorial possession and rights to share in and benefit from a homeland are derived from intimate collective and individual knowledge of the totality of a particular territory or a specific part of that territory. Throughout Latin America indigenous lands and territories in both the uplands and the lowlands are under multiple pressures from commercial agribusiness, mining, plantation forestry, industrial logging, transport networks and oil and gas pipelines (Oyendú, 1998; Amazon Watch, 2001a, 2001b; World Rainforest Movement, 1999, 2001, 2002a). These external destructive pressures may be part of both legal and illegal operations. Many of these activities open up indigenous territories to settlement by illegal colonists (Hamerschlag and Soltani, 1999). They generate direct and indirect impacts that result in the fragmentation of indigenous territories, degradation of the resource base and decreased food security, worsening health, impoverishment and cultural loss (Gray, 1986; CIMI, 1996; Stavenhagen, 2001b). The adverse impacts of disease brought into indigenous areas by outsiders are particularly acute in remote indigenous communities in voluntary isolation. The high mortality rates resulting from such exposure can threaten the very survival of these groups (Huertas Castillo, 2002). Most industrial projects still fail to recognize properly indigenous peoples ownership of land and have been carried out on their property without their consent. Likewise, governments have issued logging and mining concessions over areas with complete disregard to indigenous land and human rights (e.g. in Suriname). In most cases the violation of indigenous territorial rights is sanctioned by legal frameworks that do not recognize their ownership rights over subsurface resources, which remain the property of the state (see below). Even where governments have pledged to respect indigenous territories, out-of-date and inaccurate land cadastres have resulted in the imposition of resource concessions on indigenous lands - as occurred in some parts of the Peruvian Amazon in 2002 and 2003 during the public auction and award of timber concessions under the new Forest Law (AIDESEP, 2003; Griffiths, 2003). The increasing pressures on indigenous lands in tropical Latin America from colonization and mega-projects during the 1970s and 1980s were central to the emergence of an indigenous movement in the region. Indigenous peoples began to unite and organize to put pressure on their governments to respect indigenous land rights. These campaigns influenced progressive reforms. In several countries, civil codes have been reformed to recognize indigenous land rights over baldías: empty lands (Roldán, 1992: p. 58, 1993). With the removal of authoritarian governments in the 1980s, emerging civilian governments embarked on ambitious constitutional reforms. Between 1985 and 2000, 14 countries revised their constitutions. These reforms have eliminated the previous integrationist framework. Instead, new multicultural constitutions have adopted the concept of the pluri-ethnic nation-state (Van Cott, 1994; Sánchez, 1996; Brysk, 2000; Assies, van der Haar and Hoekema, 2001). The new multiculturalist constitutional frameworks mark a radical departure from past models of nation-building based on the elimination of cultural difference and the assimilation of indigenous peoples. It is noteworthy that the language of the reformed Latin American constitutions was often negotiated with indigenous peoples own representatives. Progressive safeguards for indigenous land rights in national land policy and new land laws, for example in Venezuela, also stem from agreed governmental commitments to respect indigenous rights under the International Labour Organizations (ILO) Convention No. 169, which, as of 2004, has been ratified by 12 countries in Latin America. With the significant exception of Mexico and Peru, 12 countries have established norms that protect indigenous communal rights to inalienable, imprescriptible and unmortgageable lands (Iturralde, 2001: p. 8). The Colombian and Ecuadorian constitutions also recognize customary legal systems and traditional authorities as legitimate public entities for autonomous land administration. In theory, such territorial entities can receive funds direct from central government (Departamento Nacional de Planeación, 1993). These constitutions have therefore in principle recognized the indigenous territorial mode of land tenure, which involves jurisdiction over the management of natural resources. Despite strong opposition from vested interests, the new Venezuelan vconstitution also guarantees some degree of local autonomy and local governance of indigenous habitats. Venezuela is also especially notable because its new demarcation law also recognizes indigenous self-demarcation as a valid part of the land regularization and titling process (Sendas, 2001; Colchester, Silva and Tomedes, 2004: pp. 36 - 37). Other constitutional reforms, such as those in Brazil, still fail to recognize the ownership rights of indigenous peoples, although possession rights are recognized (Survival International, 2000; Van Cott, 2000: p. 272; Iturralde, 2001: p. 8). Nevertheless, the 1988 Brazilian Constitution and subsequent regulations have clarified and streamlined demarcation and titling procedures (Davis and Wali, 1994). In addition to normative changes giving improved recognition of indigenous land rights, some countries have made practical progress in demarcation and titling. In Colombia, large areas of indigenous land have been titled as integral resguardo territories covering hundreds of thousands or several million hectares (Bunyard, 1990; Arango, 1992). Government agencies and environmental scientists in several countries, including Brazil, Colombia and Venezuela, have acknowledged that large indigenous territories are compatible with conservation goals and that their extensive areas can sustain viable populations of flora and fauna (Walschburger, 1992). Crucially, national policy-makers now concede that the common property regimes of indigenous peoples do not constitute open access systems that threaten resource conservation (Richards, 1997; Tresierra, 1999: pp. 138 - 139). Instead, it is now realized that, given secure tenure and protection from colonization, traditional indigenous land use and knowledge of resource management can help sustain fragile ecosystems. There are few reliable national statistics on land tenure in Latin America to assess to what extent changing views of indigenous land use have increased indigenous tenurial rights over land and resources. However, a recent survey of six high forest cover countries in Latin America (Bolivia, Brazil, Colombia, Guyana, Mexico, Peru) found that indigenous peoples have recognized use and access rights over 219 million hectares of forest land (Forest Trends, 2002: p. 5). In countries such as Ecuador, government agencies are becoming more disposed towards drawing on the skills of civil society and forging partnerships with non-governmental organizations (NGOs) and indigenous peoples organizations. In 2001, the National Institute for Agrarian Development (INDA) signed agreements with the Confederation of the Nationalities Indigenous to the Amazon of Ecuador (CONFENIAE) involving the self-demarcation of indigenous lands. Some initial progress has also been made regarding respect for the territories of indigenous peoples in voluntary isolation, for example in Peru (Amazon Alliance, 2001; Huertas Castillo, 2002). Indigenous peoples and their representative organizations in many parts of Latin America are using new technology in innovative self-demarcation initiatives. In the case of the Awa of Ecuador, these recent initiatives are being used in conjunction with practical self-demarcation methods of border-cutting and settlement along territorial boundaries. In Guyana, Suriname and Venezuela, indigenous communities have mapped their territories using global positioning system (GPS) technology with technical assistance from international NGOs. They have produced their own maps detailing land use and occupancy according to their own cultural categories. These projects have been prepared and implemented by the communities own organizations. In Guyana, the resulting maps are being used in court cases to legitimize land claims in the court and to defend territories from loggers and miners (Griffiths, 2002). As noted above, in Venezuela, community maps are being recognized by the government in a new push to demarcate indigenous lands. Community mapping has been empowering for indigenous communities who have mastered technology to record the customary land use and knowledge of natural resource management. Communities hope to build on these maps in order to plan for territorial management and sustainable use (Colchester, Silva Monterrey and Tomedes, 2004). In Belize, Maya communities have produced a set of sketch maps that together constitute a Maya Atlas that details communal territories and outside threats from loggers, roads and colonists. The map has helped communities to pinpoint and challenge threats to their lands and resources. The Maya mappers are now seeking further international support to refine their Atlas using GPS and geomatics methodologies (Poole, forthcoming). Under the Ucayali Titling and Communal Reserve Project, indigenous communities in Peru have worked with national and international NGOs to find novel ways to secure indigenous territories within the constraints of national legislation. The project used a combination of the existing Law of Native Communities and the national Forestry Law to secure land title for 209 indigenous communities over 2.5 million hectares and to establish the basis for access rights over a further 7.5 million hectares of forest reserves (García, Hvalkof and Gray, 1998; Gray, 1998b). As well as making innovative practical efforts, the indigenous movement in Latin America is also trying to influence the upstream development of land policies. Indigenous participation in the democratic system aims to ensure that natural resource and land laws take account of indigenous customary land tenure and rights to own, use and control resource use on their traditional lands. In Ecuador, CONAIE lawyers are submitting detailed proposals for drawing up new laws on forests, biodiversity and land regularization. In Panama, indigenous delegates in the legislative assembly are currently proposing a new law to protect the land rights of Embera communities in the Darien district. Indigenous peoples organizations have also sought to integrate land tenure projects in community-based natural resource management plans. The Kuna Yala General Congress in Panama, for example, has prepared its own integrated territorial development plan that combines biodiversity conservation, land conflict resolution, sustainable livelihoods and participatory research in a territory-wide plan. Similar grassroots initiatives in defence of land rights and in search of sustainable selfdevelopment are taking place throughout Latin America. Unfortunately, many of these local initiatives are not formally recognized by the state. Even if such initiatives are recognized, they often lack long-term funding for their implementation. International agencies such as the World Bank, the International Fund for Agricultural Development (IFAD), regional development banks and bilateral agencies are increasingly involved in land policy and land titling programmes in Latin America. Following adoption of the Indigenous Peoples Policy in the 1980s, World Bank infrastructure and agricultural projects in Latin America began to feature land regularization and titling components. A World Bank review of these projects in 1992 found that land titling components were of variable quality. Failing projects were found to be the fault of poor baseline studies that did not take account of indigenous tenure and complex situations on the ground. Relatively successful projects were associated with good baseline studies and the existence of political will and capacity of the implementing agencies to carry out land demarcation titling (Wali and Davis, 1992: pp. 10 - 13). Some World Bank projects have had serious problems with land titling, particularly where it formed a component within a wider agricultural development project. For example, in the Eastern Lowlands Project in Bolivia in the mid- 1990s, vested interests blocked indigenous land claims and actually appropriated and obtained title to indigenous lands, resulting in displacement and hardship for affected indigenous communities (CIDOB, CANOB, CABI and TURUBO, 2000). A later nationallevel land administration project in Bolivia with an indigenous component also had negative impacts on indigenous territories because of the failure to involve indigenous representatives in establishing the technical rules for demarcation, which then failed to recognize indigenous land tenure regimes properly and threatened to fragment indigenous territories (Griffiths, 1999). In Brazil, the World-Bank-assisted Indigenous Lands Project (PPTAL) has sought to consult indigenous communities and NGOs, but indigenous organizations still feel that their involvement in the design, governance and implementation of the project has been limited and should be strengthened (Arruda, 2001: pp. 48 - 49). A recent review of experience with indigenous land titling in Inter-American Development Bank (IADB) projects also found patchy experience across, within and between projects in the same country (Plant and Hvalkof, 2001). In Panama, for example, the IADB-assisted Program for Sustainable Development of the Darien supported the physical demarcation of the Madungandi Comarca and promoted baseline studies with indigenous organizations and local communities. By contrast, in Peru, the IADB-assisted Programa Especial para la Titulación de Tierras (PETT) did not involve indigenous representatives in the design of the project, and although communal titles are not prohibited, most work has focused on individual titles. Indigenous organizations in Peru consequently have been critical of the project (Plant and Hvalkof, 2001: pp. 58 - 63). One major criticism is that the PETT programme lacks a specific budget to deal with indigenous land title claims in Amazonia, where indigenous communities suffer insecure tenure and are increasingly affected by land conflicts (Griffiths, 2003). In other cases, land regularization projects supported by international agencies have been more successful. The World-Bank-assisted Colombia-Natural Resource Management Project is a case in which successful titling was carried out under complex and difficult local circumstances involving indigenous and Afro-Colombian communities and different government agencies dealing with land administration and protected areas. All parties to the project agree that success was grounded in active local participation and monitoring by community-based organizations seeking land titles (Ngweno, 2000). Even though the national Law of Native Communities guarantees that our territories are inalienable, the mining law allows the Ministry of Energy and Mines to sell concessions to anyone ... Peruvian national legislation should guarantee and protect our new Arakmbut Communal Reserve which unites out ancestral territories, yet non-indigenous hunters illegally enter our hunting grounds to kill and sell animals to the market. This is another example of how we are illegally deprived of our natural resources while the Peruvian authorities provide no support for our legitimate claims. Government functionaries dealing with land policy still hold entrenched and prejudicial ideas that indigenous peoples make unreasonable claims to too much land. In some cases, government departments have unwritten internal policies to limit the extension of land titles for existing indigenous communities and to block applications for new titles (Griffiths, 2003). In Chile, indigenous communities are likewise still awarded much reduced land titles, while their wider territory is being appropriated by commercial tree plantation companies (World Rainforest Movement, 2002b). Many Mapuche communities suffer serious land shortages and have no option but to re-occupy their traditional lands - often with severe risks to their safety and liberty as Chilean authorities use brutal methods to remove and punish those trespassing on private property (FIDH, 2003; Loncon Antileo, 2003). In upland areas, indigenous communities continue to endure inadequate access to land. In highland Colombia, for example, the programme of land restitution overseen by the Colombian Institute for Agrarian Reform (INCORA) is stifled by budget shortages. In Ecuador, a land restitution programme funded by the World Bank and IFAD has been hampered by delays in the disbursement of project funds, continuing problems with conflict resolution between indigenous and non-indigenous parties, and a failure to prioritize land issues in project implementation (Van den Berg, 2002). Where countries have undertaken constitutional reforms to safeguard indigenous land rights, there are still numerous obstacles to their implementation. Even if indigenous communities have been awarded legal titles, government agencies typically lack resources and capacity to protect such titled lands from encroachment. In Costa Rica, for example, 49 percent of the area of indigenous reserves is occupied by illegal settlers; in particular reserves, as much as 85 percent is settled by outsiders (Ardito, 1996). In short, despite progress in legal protections for indigenous territories, such laws are often not enforced. Although indigenous organizations continue to press governments and international financial institutions to take account of land tenure and territorial rights in macroeconomic reforms, national economic policies and structural adjustment loans still largely fail to address indigenous land tenure and food security issues (Garzón, 2003). Indigenous organizations therefore complain that the positive work done by some international agencies in support of indigenous land titling programmes is being undermined by the destructive macroeconomic interventions of the same agencies (Griffiths, 1999). At the same time, agencies such as the World Bank are criticized for formulating inadequate policies on land tenure and indigenous peoples (Griffiths, 2001). Although social scientists working for transnational agencies may promote interventions based on communal tenure and ethnodevelopment, economists design agrarian programmes with no indigenous components and little or no indigenous participation (Plant and Hvalkof, 2001). Despite commitments to secure indigenous land tenure, few governments have well-funded national-level demarcation and titling programmes for indigenous peoples. In most countries, indigenous agencies are a low priority for governments and consequently they suffer repeated budget cuts, which limit their capacity to fund land titling and restitution programmes (e.g. IWGIA, 2001: pp. 149, 162). In 2000 and 2001 indigenous organizations in Bolivia, Ecuador and Mexico were again obliged to stage mass protests to urge their governments to honour past commitments and speed the titling process. In most countries in Latin America legal contradictions, obstacles and discrimination continue to surround the tenure and ownership on traditional indigenous lands designated as protected areas. In Panama, for example, although Comarcas confer substantial territorial rights and powers of self-government for indigenous peoples, within protected areas these rights are extinguished or severely limited by the state (World Rainforest Movement, 2002c). In some countries, e. Colombia, Ecuador and Peru, indigenous communities may negotiate access and use rights in co-management agreements with the government, but secure legal tenure inside protected areas is denied or remains ambiguous. International agencies such as the Global Environment Facility (GEF) have tended to sidestep these crucial land tenure issues and so indirectly reinforce inadequate land laws through their financial support for protected areas and networks of biological corridors on lands traditionally used and occupied by indigenous peoples (Griffiths, 2004). On the ground, indigenous peoples continue to face opposition from powerful economic and political actors, including ranchers and miners, who use racist and inappropriate non-indigenous property and land-use concepts to challenge indigenous claims, alleging that indigenous families do not need large land areas. In countries such as Brazil, Colombia and Mexico powerful landowners have forcibly evicted indigenous peoples, assassinated indigenous leaders and intimidated indigenous communities in order seize and claim title to their land (Branford and Glock, 1985: p. 22; Monbiot, 1995: p. 152; Amnesty International, 1993: pp. 77 - 78). Powerful commercial landholding interests are also influential in the political realm at both local and national level. Such interests continue to work hard to persuade government authorities to weaken legal reforms and block or limit recognition of indigenous land claims (Urteaga, 2001). At the same time, although land titles may be secured on paper, in practice indigenous peoples remain marginalized and lack adequate legally recognized powers to govern or benefit from resources on their own lands (Iturralde, 2001: p. 12; Urteaga, 2001: pp. 288 - 289). In recent years revised national constitutions and domestic legislation in several countries in Latin America have recognized the communal land tenure and territorial rights of indigenous peoples. In some countries, notably Brazil and Colombia, significant practical advances have been made in the demarcation and titling of indigenous territories. Indigenous peoples themselves have been fundamental to these progressive reforms and they continue to make innovative efforts to secure their territories and defend them against destructive developments. Nevertheless, indigenous peoples still face numerous normative, practical, political and cultural obstacles to effective recognition of their land rights. Where structural discrimination (Stavenhagen, 2001a), outdated laws and top-down development policies are difficult to reform at the domestic level, indigenous organizations are likely increasingly to defend their land rights in international courts (e.g. ILRC, 2001). On the ground, government agencies and donors could help make a difference by further direct support to indigenous peoples initiatives to demarcate, title and administrate their traditional territories. At the national level, such agencies could make a contribution to further positive reforms by supporting the active and informed participation of indigenous peoples representatives in the formulation of national plans and laws on land administration, natural resource use, and conservation and economic development. Further positive change could also be fostered through donor support to governments to undertake legal and institutional reforms properly to implement international standards on the land and territorial rights of indigenous peoples. AIDESEP (Asociación Interétnica de Desarrollo de la Selva Peruana). 2003. Concesiones forestales se convierten en una nueva amenanza para los territorios indígenas. Press release, 31 October 2003. Lima. Amazon Alliance. 2001. Update on the situation of uncontacted indigenous peoples in Madre de Dios. E-mail circular, September 2001. Amazon Watch. 2001a. New pipelines threaten intact Amazon rainforests in Brazil. Mega-Project Alert. Vol. 2 (June) Topanga, USA, Amazon Watch. Amazon Watch. 2001b. The new heavy crude pipeline in Ecuador: fueling a second oil boom in the Amazon Amazon. Mega-Project Alert, Vol. 1 (June). Topanga, USA, Amazon Watch. Amnesty International. 1993. The Americas: human rights violations against indigenous peoples. London, Amnesty International Publications. Arango, R. 1992. Situación territorial y tratamiento legal de las áreas indígenas del litoral pacífico y la Amazonia de Colombia. In M. Cárdenas, H.D. Correa & M. Gómez, eds. Derechos territoriales indígenas y ecología, pp. 223 - 260. Bogotá, Cerec-Fundación Gaia. Ardito, W. 1996. Los indígenas y la tierra en las leyes de América. London, Latina Survival International. Arruda, R. 2001. Territórios indígenas no Brasil: aspectos jurídicos e socioculturais. Estud. Latinamericanos, 21: 39 - 55. Assies, W., van der Haar, G. & Hoekema, A., eds. 2001. The challenge of diveristy: indigenous peoples and the reform of the state in Latin America. Amsterdam, Netherlands, Thela Publishers. Baksh, M. & Johnson, A. 1990. Insurance policies among the Machiguenga: an ethnographic analysis of risk management in a non-western society. In E. Cashdan, ed. Risk and uncertainty in tribal and peasant economies. pp.193 - 227. Boulder, USA, and London, Westview Press. Balée, W. 1995. Historical ecology in Amazonia. In L. Sponsel, ed. Indigenous peoples and the future of Amazonia, pp. 97 - 110. Tucson, USA, and London, University of Arizona Press. Barbira-Scazzochio, F., ed. 1980. Land, people and planning in contemporary Amazonia. Cambridge, UK, Cambridge University Press. Barraclough, S. & Eguren, F. 2001. Agrarian reform issues and initiatives in three Andean countries in South America. In K. Ghimire & B. Moore, eds. Whose land? Civil society perspectives on land reform and rural poverty reduction, pp. 217 - 250. Geneva and Rome, UNRISD - IFAD. Bebbington, A. & Thiele, G., eds. 1993. NGOs and the State in Latin America: rethinking roles in sustainable agricultural development. London, Routledge. Bedoya, E. & Klein, L. 1996. Forty years of political ecology in the Peruvian upper forest: the case of Upper Huallaga. In L. Sponsel, T. Headland & R. Bailey, eds. Tropical deforestation: the human dimension, pp. 165 - 186. New York, USA, Columbia University Press. Benton, J. 1999. Agrarian reform in theory and practice: a study of the Lake Titicaca region of Bolivia. Aldershot, UK, and Sydney, Australia, Ashgate. Brockett, C. 1990. Land, power, and poverty: agrarian transformation and political conflict in Central America. Boulder, USA, Westview Press. Brysk, A. 2000. From tribal village to global village: Indian rights and international relations in Latin America. Stanford, USA, Stanford University Press. Bunyard, P. 1990. The Colombian Amazon: policies for the protection of its indigenous peoples and their environment. Bodmin, UK, Ecological Press. Cárdenas, M., Correa, H.D. & Gómez, M., eds. 1992. Derechos territoriales indígenas y ecología. Bogotá, Cerec-Fundación Gaia. Carter, W. 1964. Aymara communities and the Bolivian agrarian reform. Gainesville, USA, University of Florida Press. Chirif, A., García, P. & Chase-Smith, R. 1991. El indígena y su territorio: estrategias para la defensa de los pueblos y territorios indígenas en la cuenca amazónica. Lima, Oxfam-America/Coordinadora de las Organizaciones Indígenas de la Cuenca Amazónica (COICA). CIDOB (Confederción de Pueblos Indígenas de Bolivia). 2001. Resumen de relación de superficies del proceso de saneamiento CIDOB. E-mail circular, November 2001. CIDOB, CANOB, CABI and TURUBO. 2000. Pueblos indígenas y el Proyecto Tierras Bajas del Este (PTBE) - Bolivia: un informe del Taller Indígena (see www.forestpeoples.org). CIMI (Brazilian church agency for indigenous affairs). 1996. Review of developments pertaining to the promotion and protection of human rights and fundamental freedoms of indigenous peoples: health and indigenous peoples. Addendum by Indigenous Missionary Council, Economic and Social Council, Commission on Human Rights, E/CN.4/Sub.2/AC.4/1996/3/Add.2. Colchester, M. & Lohmann, L., eds. 1995. The struggle for land and the fate of the forests. Penang, Malaysia, World Rainforest Movement - The Ecologist - Zed Books. Colchester, M., Silva Monterrey, N. & Tomedes, R. 2004. Protecting and encouraging customary use of biological resources: the Upper Caura Forest. Moreton-in-Marsh, UK, and Guayana, Peoples Programme and Kuyuyani. Davis, S. 1973. Victims of the miracle: development and the Indians of Brazil. New York, USA, Cambridge University Press. Davis, S. 1991. Indigenous views of land and the environment. Background Paper No. 10, World Development Report, 1992. Washington, DC, World Bank. Davis, S. & Wali, A. 1994. Indigenous land tenure and tropical forest management in Latin America. Ambio, 23(8): 485 - 490. Departamento Nacional de Planeación. 1993. Bases para la conformación de Entidades Territoriales Indígenas - ETIS. Santafé de Bogotá, Colombia. Dorner, P. & Thiesenhusen, W.C. 1992. Land tenure and deforestation: interactions and environmental implications. Geneva, United Nations Research Institute for Social Development (UNRISD). ECLAC (Economic Commission for Latin America and the Caribbean). 1995. Family and future: a regional programme in Latin America and the Caribbean. Santiago, UN. FIDH (Federación Internacional de los Derechos Humanos). 2003. Chile - Pueblo mapuche: entre olvidado y la exclusión. Misión Internacional de Investigación, FIDH. Forest Trends. 2002. Who owns the worlds forests? Washington, DC, Forest Trends and Center for International Environmental Law. Fox, J.A. & Brown, L.D., eds. 1998. The struggle for accountability: the World Bank, NGOs, and grassroots movements. Cambridge, USA, and London, The MIT Press. García, P. 2002. Territorios indígenas: tocando a las puertas del derecho. Revista de Indias, LXI(223). García, P., Hvalkof, S. & Gray, A. 1998. Liberación y derechos territoriales en Ucayali - Perú. IWGIA Document No. 24. Copenhagen, IWGIA. Garzón, C. 2003. The transformation of human rights into socio-environmental conflicts: the role of the World Bank in the Andean-Amazon region. Washington, DC, Amazon Alliance. Ghimire, K., ed. 2001. Land reform and peasant livelihoods: the social dynamics of rural poverty and agrarian reforms in developing countries. London, ITDG Publishing. Ghimire, K. & Moore, B., eds. 2001. Whose land? - Civil society perspectives on land reform and rural poverty reduction. Geneva and Rome, United Nations Research Institute for Social Development (UNRISD) - International Fund for Agricultural Development (IFAD). Goodman, D. & Redclift, M. 1981. From peasant to proletarian: capitalist development and agrarian transitions. Oxford, UK, Blackwell. Grasmick, J. 1979. Land and the forest-dwelling South American Indian: the role of national law. Buffalow Law Review, 27(4): 759 - 800. Grasmick, J. 1980. Land tenure and the South American Indian: an anthropological and legal perspective. Human Rights and Development Working Paper No. 5. London, Anti-Slavery Society. Gray, A. 1986. And after the gold rush...? : human rights and self-development among the Amarakaeri of Southeastern Peru. IWGIA Document 55. Copenhagen, IWGIA. Gray, A. 1997. Indigenous rights and development: self-determination in an Amazonian community. Providence, USA, and Oxford, UK, Berghahn Books. Gray, A. 1998a. Development policy, development protest: the World Bank, indigenous peoples and NGOs. In J.A. Fox & L.D. Brown, eds. The struggle for accountability: the World Bank, NGOs, and grassroots movements, pp. 267 - 301. Cambridge, USA, and London, The MIT Press. Gray, A. 1998b. Demarcando Desarrollo: titulación de territorios indígenas en Perú. In P. García, S. Hvalkof & A. Gray, eds. Liberación y derechos territoriales en Ucayali - Perú, pp. 169 - 221. IWGIA Document No. 24. Copenhagen, IWGIA. Griffiths, T. 1999. World Bank projects and indigenous peoples in Ecuador and Bolivia. Latin America Review for the Biodiversity Support Program, Consultant Report, November 1999. Moreton-in-Marsh, UK, Forest Peoples Programme. Griffiths, T. 2001. Forwards or backwards: the World Bank, indigenous peoples and international development. Indigenous Affairs No. 54, 01/02. Griffiths, T. 2002. Guyana: empowerment of indigenous peoples through participatory mapping. World Rainforest Movement Bull., 62 (September). Griffiths, T. 2003. FPP Field Trip Report: Peru. Moreton-in-Marsh, UK, Forest Peoples Programme. Griffiths, T. 2004. Help or hindrance? The global environment facility, indigenous peoples and biodiversity conservation. Cultural Survival Quarterly, Spring. Grindle, M. 1990. Agrarian reform in Mexico: a cautionary tale. In R. Prosterman, M. Temple & T. Hanstad, eds. Agrarian reform and grassroots development: ten case studies, pp. 179 - 204. Boulder, USA, and London, Lynne Rienner Publishers. Gros, C. 1991. Colombia indígena: identidad cultural y cambio social. Bogotá, Cerec-Fundación Gaia. Hammond, D., Dolman, P. & Watkinson, A. 1995. Modern Ticuna swidden fallow management in the Colombian Amazon. Human Ecology, 23(3): 335 - 356. Harris, O. 1999. To make the earth bear fruit: essays on fertility, work and gender in highland Bolivia. London, Institute of Latin American Studies. Hecht, S. & Cockburn, A. 1990. The fate of the forest: destroyers and defenders of the Amazon. London, Penguin. Hess, C. 1997. Hungry for hope: on the cultural and communicative dimensions of development in highland Ecuador. London, Intermediate Technology Publications. Howe, J. 1998. Those who would not kneel: Panama, the United States and the San Blas Kuna. Washington, DC, and London, Smithsonian Institution Press. Huertas Castillo, B. 2002. Los pueblos indígenas en aislamiento: su lucha por sobrevivencia y libertad. Copenhagen, IWGIA. ILRC (Indian Law Resource Center). 2001. Land mark victory for Indians in international human rights case against Nicaragua. Press Release, 18 September 2001. IWGIA (International Work Group for Indigenous Affairs). 2001. The indigenous world, 2000 - 2001. Copenhagen. Iturralde, D.A. 2001. Tierras y territorios indígenas: discriminación, inequidad y exclusión. Paper presented at the Conference on Racism and Public Policy, Durban, South Africa, 3 - 5 September 2001. Geneva, United Nations Research Institute for Social Development (UNRISD). Johnston, B. & Kilby, P. 1975. Agriculture and structural transformations: economic structure in late developing countries. Oxford, UK, Oxford University Press. Lehmann, D., ed. 1982. Ecology and exchange in the Andes. Cambridge, UK, Cambridge University Press. Llanos, H. & Pineda, R. 1982. Etnohistoria del Gran Caquetá (siglos XVI-IXX). Bogotá, Fundación de Investigaciones Arqueológicas Nacionales, Banco de la República. Loncon Antileo, L. 2003. El racismo del estado chileno y violación sistemática de los derechos humanos a mapuche (available at www.derechosindigenas.cl). Maybury-Lewis, D. 1991. Becoming Indian in lowland South America. In G. Urban & J. Sherzer, eds. Nation-states and Indians in Latin America, pp. 207 - 235. Austin, USA, University of Texas Press. Molina, H. 2000. Historic autonomies: Yaqui autonomy. In A.B. Cal y Mayor, ed. Indigenous autonomy in Mexico, pp. 98 - 116. Copenhagen, IWGIA. Monbiot, G. 1995. Brazil: land ownership and the flight to Amazonia. In M. Colchester & L. Lohmann, eds. The struggle for land and the fate of the forests, pp. 139 - 178. Penang, Malaysia, World Rainforest Movement - The Ecologist - Zed Books. Mozder, M. & Ghimire, K. 2001. An overview of agrarian reforms and peasant organizations in Central America. In K. Ghimire & B. Moore, eds. Whose land? Civil society perspectives on land reform and rural poverty reduction, pp.195 - 218. Geneva and Rome, UNRISD - IFAD. Ngweno, B. 2000. On titling collective property, participation and natural resource management - implementing indigenous and Afro-Colombian demands: a review of bank experience in Colombia. Washington, DC, World Bank. Oliveira, J. 1989. Os poderes e as terras indígenas PPGAS. Rio de Janeiro, Brazil, Museu Nacional. Oyendú. 1998. Hidrocarburos y territorios Indígenas. Oyendú, 2(June): 4. Plant, R. 1998. Issues in indigenous poverty and development. Washington, DC, Inter-American Development Bank. Plant, R. & Hvalkof, S. 2001. Land titling and indigenous peoples in Latin America. Washington, DC, Inter-American Development Bank. Poole, P. (forthcoming). License to map: a guide to community-based mapping. Amsterdam and London, Bothends and Rainforest Foundation. Preston, D. & Redclift, M. 1980. Agrarian reform and rural change in Ecuador. In D. Preston, ed. Environment, society and rural change in Latin America. Chichester, UK, John Wiley. Psacharopoulos, G. & Patrinos. H., eds. 1994. Indigenous people and poverty in Latin America: an empirical analysis. World Bank Regional and Sectoral Studies. Washington, DC, World Bank. Richards, M. 1997. Common property resource institutions and forest management in Latin America. Development and Change: 28: 95 - 117. Rodríguez, C. & Van der Hammen, C. 1990. Ocupación y utilización del espacio por indígenas y colonos en el Bajo Caquetá (Amazonia colombiana). In F. Correa, ed. La selva humanizada: ecología alternativa en el trópico humedo colombiano, pp. 189 - 225. Santafé de Bogotá, ICAN Fondo FGN-Cerec. Roldán, R. 1992. El problema de la legalidad en la tenencia de la tierra y el manejo de los recursos naturales de territorios indígenas en regiones de selva tropical de Suramérica. In M. Cárdenas, H.D. Correa & M. Gómez, eds. Derechos territoriales indígenas y ecología, pp. 37 - 74. Bogotá, Cerec-Fundación Gaia. Roldán, R. 1993. Reconocimiento legal de tierras a indígenas en Colombia. In M. Cárdenas & H.D. Correa, eds. Reconocimiento y demarcación de territorios indígenas en Colombia, pp. 56 - 84. Bogotá, Cerec-Fundación Gaia. Roosevelt, A., ed. 1994. Amazonian indians from prehistory to the present. Tucson, USA, University of Arizona Press. Rudel, T. & Horowitz, B. 1993. Tropical deforestation: small farmers and land clearing in the Ecuadorian Amazon. New York, USA, Columbia University Press. Salick, J. 1992. Subsistence and single women among the Amuesha of the Upper Amazon, Peru. Society and Natural Resources, 5(1): 37 - 52. Sánchez, E., ed. 1996. Derechos de los pueblos indígenas en las constituciones de América Latina. Santafé de Bogotá, Disloque, Editores-Fundación Gaia. Sendas. 2001. Demarcación del hábitat indígena. Sendas de vida y justicia en Amazonas 9(27). Shaw, R. 1977. Land tenure and the rural exodus in Chile, Colombia, Costa Rica and Peru. Gainesville, USA, University of Florida Press. Sponsel, L., Headland, T. & Bailey, R., eds. 1996. Tropical deforestation: the human dimension. New York, USA, Columbia University Press. Stavenhagen, R. 2001a. El derecho de sobrevivencia: la lucha de los pueblos indígenas en América Latina contra el racismo y la discriminación. San José, Colombia, IIDH-BID. Stavenhagen, R. 2001b. Report of the Special Rapporteur on the situation of human rights and fundamental freedoms of indigenous people, Mr. Rodolfo Stavenhagen, submitted pursuant to Commission resolution 2001/57. Geneva, UN Doc. E/CN.4/2002/97. Survival International. 2000. Disinherited: Indians in Brazil. London. Swepston, L. 1978. The Indian in Latin America: approaches to administration, integration, and protection. Buffalow Law Review, 27(4): 715 - 756. Treakle, K. 1998. Ecuador: structural adjustment and indigenous environmentalist resistance. In J.A. Fox & L.D. Brown, eds. The struggle for accountability: the World Bank, NGOs, and grassroots movements, pp. 219 - 264. Cambridge, USA, and London, The MIT Press. Tresierra, J. 1999. Rights of indigenous peoples over tropical forest resources. In K. Keipi, ed. Forest resource policy in Latin America, pp. 135 - 160. Washington, DC, Inter-American Development Bank. Urban, G. & Sherzer, J., eds. 1991. Nation-States and Indians in Latin America. Austin, USA, University of Texas Press. Urteaga, P. 2001. Territorial rights and indigenous law: an alternative approach. In W. Assies, G. van der Haar & A. Hoekema, eds. The Challenge of diveristy: indigenous peoples and the reform of the state in Latin America, pp. 275 - 292. Amsterdam, Netherlands, Thela Publishers. Van Cott, D.L. 1994. Indigenous peoples and democracy in Latin America. New York, USA, St. Martins Press. Van Cott, D.L. 2000. The friendly liquidation of the past: the politics of diversity in Latin America. Pittsburg, USA, University of Pittsburg Press. Van den Berg, M.H.J. 2002. Mainstreaming Ethnodevelopment: poverty and ethnicity in World Bank policy. Review of International Social Questions (available at http://www.risq.nl). Wali, A. & Davis, S. 1992. Protecting Amerindian lands: a review of World Bank experience with indigenous land regularization programs in lowland South America Latin. America and the Caribbean Technical Department, Regional Studies Program, Report No. 19. Washington, DC, World Bank. Walschburger, T. 1992. Delimitación y manejo de territorios indígenas ecológicamente equilibrados en áreas de selva húmeda tropical. In M. Cárdenas, H. D. Correa & M. Gómez, eds. Derechos territoriales indígenas y ecología, pp. 261 - 272. Bogotá, Cerec-Fundación Gaia. Werner, D., Flowers, M., Ritter, M. & Grass, D. 1979. Subsistence productivity and hunting effort in native South America. Human Ecology, 7: 303 - 315. Wolf, E. 1959. Sons of the shaking earth: the people of Mexico and Guatemala - their land, history and culture. Chicago, USA, and London, University of Chicago Press. World Rainforest Movement. 2000. Mexico: ecosystem fragmentation and inequity. World Rainforest Movement Bulletin, 36(July) (available at www.wrm.org.uy). World Rainforest Movement. 2001. Mexico: oil palm and the different meanings of Chiapas. World Rainforest Movement Bulletin, 47(June) (available at www.wrm.org.uy). World Rainforest Movement. 2002a. Peru: indigenous peoples and their forests threatened by gas exploitation. World Rainforest Movement Bulletin, 56(March) (available at www.wrm.org.uy). World Rainforest Movement. 2002b. Panama: protected areas vs. indigenous peoples. World Rainforest Movement Bulletin, 57(April) (available at www.wrm.org.uy). World Rainforest Movement. 2002c. Chile: invasion of Mapuche territory by tree plantation companies. World Rainforest Movement Bulletin, 57(April) (available at www.wrm.org.uy). World Rainforest Movement. 2004. Protected areas: protected against whom? Montevideo and Quito, World Rainforest Movement and Oil Watch.